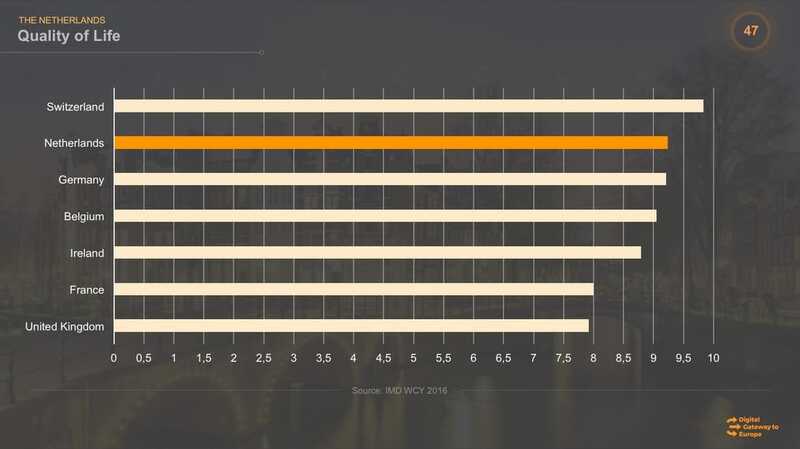 Tech companies have chosen the Netherlands as the place to do business in Europe. 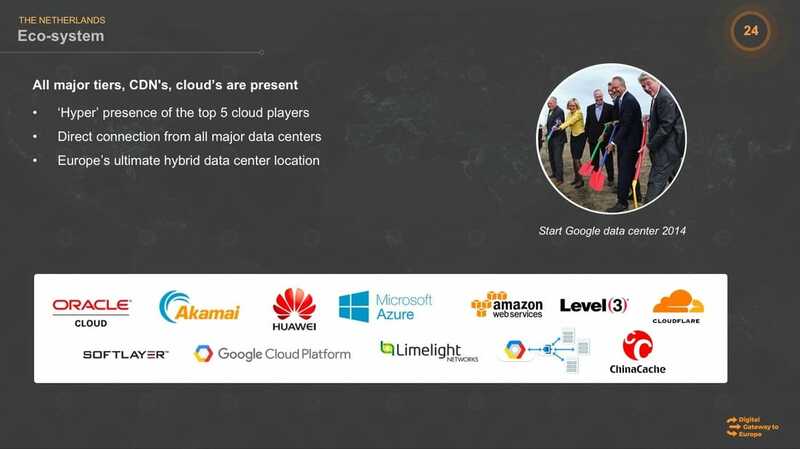 These companies choose the Netherlands to locate their headquarters, data centers, sales and marketing offices, and/or distribution centers because of its favorable ecosystem. ​Here you learn about the tech support ecosystem, doing business in the Netherlands, our language skills, the quality of life, tax incentives and many other things. Contact us for free advice about the ​Digital Gateway to Europe. ​This site is created by the industry, for the industry. Crazy deadline? Don’t worry! We’ll have your Amsterdam POP up and running in no-time! Read more about Quanza here. Gateway Business Support offers a wide range of business support services to foreign companies already having a presence in the Netherlands or starting up in the Netherlands. ​Read more about Gateway Business Support here. ​Doing Business in the Netherlands (DBi) is a comprehensive and integrated service provider platform, covering all aspects and functions required by a business to establish and operate in the Netherlands. ​Read more about Doing Business in the Netherlands here. 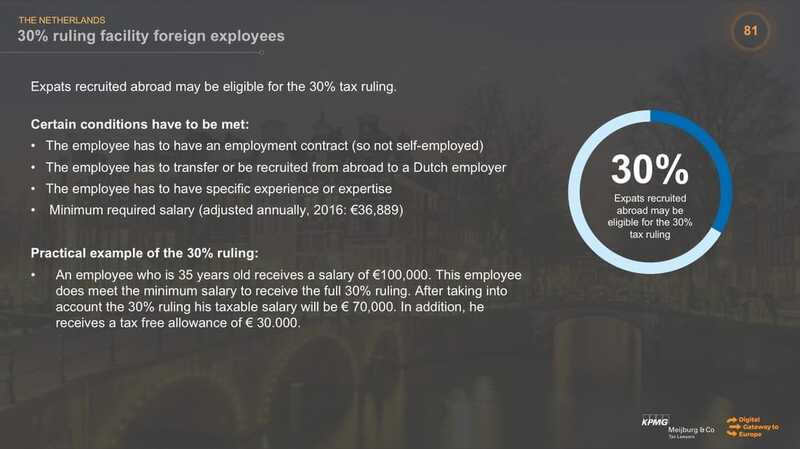 The Netherlands created a opportune tax system for international (digital) business. It's centrally located in Europe, known for its favorable VAT system, has no double taxation on foreign income and no withholding taxes. Tax incentives as 5% effective tax rate for income from patents and software. And a 30% ruling facility for foreign employees and pro-active tax authorities supporting foreign investment. The “DNA” of Meijburg & CoTaxation is an everyday phenomenon. Tax affects everybody, whether corporate income tax, personal income tax, VAT, customs duties or other taxes. The Dutch Revenue's slogan is “We cannot make it more fun, but we can make it simpler”. Tax legislation nevertheless remains very complex and, without the correct tax advice, you could be paying too much tax or encounter difficulties in dealing with the authorities and other stakeholders. It is also possible that you are not fully benefiting from savings opportunities. That is why it is important to have a committed tax advisor to provide you with high-quality advice. By engaging that kind of advisor from Meijburg & Co, taxation could even start to become fun! The Netherlands provides a unique tech infrastructure and ecosystem for the data driven economy.